You are here: Home / Safety / Commentary / Vol. 2 – Is Anchorage Load Testing Doing More Harm than Good? While the pictured anchorage technically “passed” the test, it is clearly damaged and unusable to protect workers at height. 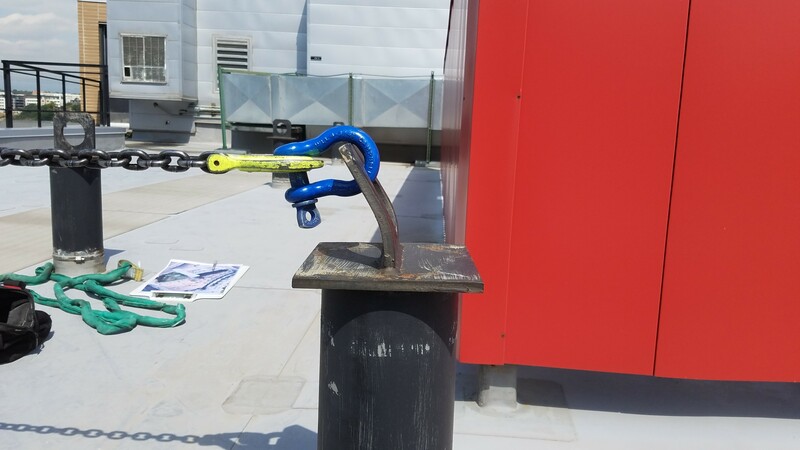 Because of the new OSHA regulation language on rope descent anchorages, which we covered in our last blog post, many facility owners are heavily investing in designing, installing, inspecting and testing anchorages. Too often, though, the resources spent do nothing more than provide a false sense of security—or worse, cause more harm than good. It is important to note that neither OSHA regulations nor ANSI standards explicitly require load testing of anchorages. And why should they? Buildings and building components have been designed and built for decades (if not centuries) using predictable and reliable engineering principles with no need for “load testing” to validate capacity. Still, we have seen many organizations—with an intent to comply with OSHA regulations—inadvertently damage anchorages, rendering them unusable. Ironically, in many cases, although the anchorage has “passed” the test, it must be replaced due to the damage caused by the testing. For example, in the photograph shown, the anchorage technically passed the test (supported the load), but has been deformed and must be taken out of service and replaced. As the ANSI/ASSP Z359 Committee recently explained in its bulletin on this subject, structural analysis is an important part of determining anchorage strength. I would say this even more directly: load testing without analysis is not a reliable way to determine anchorage strength. If you are a building owner, or a member of a team responsible for providing rope descent anchorages, don’t be fooled into thinking that you can just pull on anchorages without a more thorough analysis. In the next blog post in this series, we provide more information on what anchorage analysis and certification requires. We welcome your comments and additional questions on this topic below. « Vol. 1 – Do I Have Rope Descent Anchorages and What Does that Mean for Me?